Sjoegren’s syndrome (SjS) is a chronic, systemic disease that may occur as a single primary disease or second to rheumatoid arthritis and other rheumatic autoimmune diseases. The principal manifestations of the disease are dry eyes and dry mouth resulting from immune mediated damage of the lacrimal and salivary glands. A characteristic lymphocytic infiltrate develops that can be seen on biopsy samples. Approximately two thirds of patients with SjS have circulating autoantibodies to anti-SS-A (Ro) and/or anti-SS-B (La). Systemic manifestations may occur, which include vasculitis, peripheral neuropathy, renal tubular acidosis, pulmonary involvement, lymphoproliferative disease and immunological abnormalities. They are most commonly found among those with high levels of anti-SS-A and anti-SS-B autoantibodies. Lymphadenopathy and lymphoma are also possible comorbidities. Currently there is no cure. Sicca symptoms may be treated symptomatically but in contrast to other autoimmune diseases, modern therapeutic approaches with disease modifying drugs or biologic agents have not yet been implemented adaequately in SjS. To evaluate these therapeutic options also for SjS patients, it is necessary to perform clinical studies with classified patient cohorts. Defined entry criteria and end points that allow measurement of the effect of new treatments are needed. Outcomes may be documented using the recently developed EULAR SjS Disease Activity Index (ESSDAI). (2, 3). The criteria developed by the Working Group are intended for this classification of patients for clinical studies. 1) The SICCA cohort, comprising 3,514 patients (including 1,578 individuals who meet the ACR classification criteria for primary SjS) recruited from Argentina, China, Denmark, India, Japan, the UK, and the US. 2) The Paris-Sud cohort, which consists of 1,011 patients (including 440 individuals who meet the AECG criteria for primary SjS) recruited in Paris. 3) The OMRF cohort, which includes 837 participants (including 279 individuals who meet the AECG criteria for primary SjS) evaluated at either the Sjoegren’s Research Clinic at OMRF or the Sjoegren’s Clinic at the University of Minnesota. Just to keep in mind: these criteria are intended to classify patients for clinical studies, they are NOT diagnostic criteria. That is one of the reasons why the more objective whole saliva flow rate (UWS) and the Schirmer’s test have replaced the items oral an ocular symptoms that had been present in the original AECG criteria, in spite of the fact that these symptoms are important for the patients affected by primary SjS. More than 94 % of the individuals experience at least one of these symptoms. From a clinicians point of view the new criteria may look rather academic. However, in spite of the large armory of therapeutic options that are successfully used to manage other autoimmune inflammatory diseases, SjS is mostly treated symptomatically. Reliable studies are urgently needed to evaluate these therapeutic options for SjS patients, with the final goal to heal the disease instead of just relieving symptoms. What about diagnostic criteria? There is no known “Gold Standard” for diagnosing SjS, however things may change in the time coming, with the development of improved or novel serologic assays or the implementation of parotid ultrasonography. Shiboski CH, Shiboski SC, Seror R, Criswell LA, Labetoulle M, Lietman TM, et al. 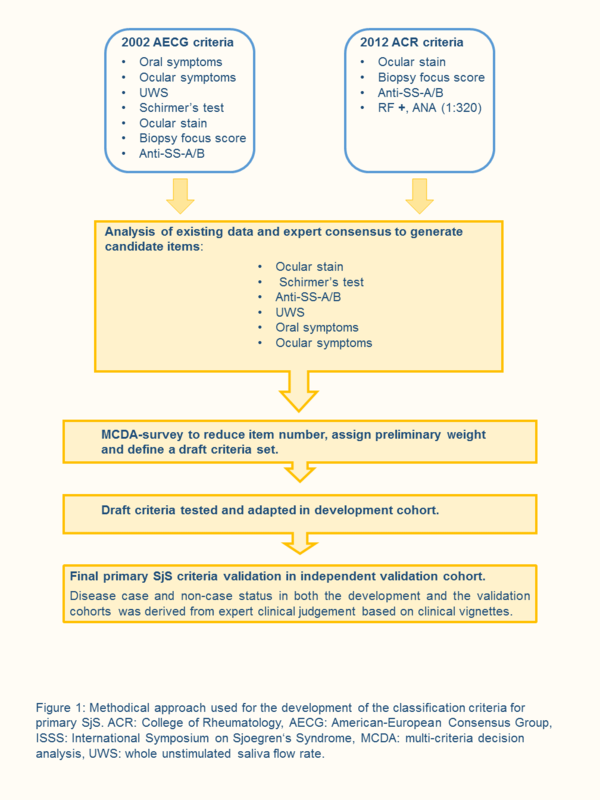 2016 American College of Rheumatology/European League Against Rheumatism Classification Criteria for Primary Sjogren’s Syndrome: A Consensus and Data-Driven Methodology Involving Three International Patient Cohorts. Arthritis Rheumatol. 2016. Seror R, Bowman SJ, Brito-Zeron P, Theander E, Bootsma H, Tzioufas A, et al. EULAR Sjogren’s syndrome disease activity index (ESSDAI): a user guide. RMD Open. 2015;1(1):e000022. Rasmussen A, Ice JA, Li H, Grundahl K, Kelly JA, Radfar L, et al. Comparison of the American-European Consensus Group Sjogren’s syndrome classification criteria to newly proposed American College of Rheumatology criteria in a large, carefully characterised sicca cohort. Annals of the Rheumatic Diseases. 2014;73(1):31-8. Vitali C, Bombardieri S, Jonsson R, Moutsopoulos HM, Alexander EL, Carsons SE, et al. 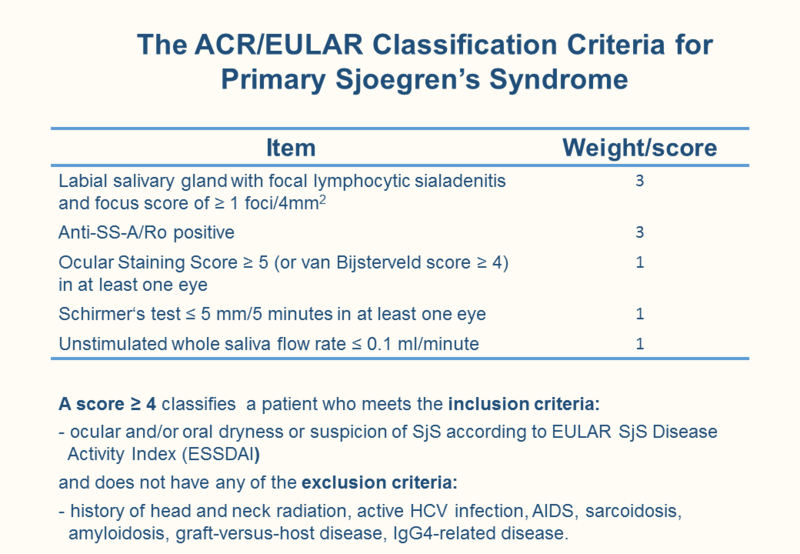 Classification criteria for Sjogren’s syndrome: a revised version of the European criteria proposed by the American-European Consensus Group. Ann Rheum Dis. 2002;61(6):554-8. Shiboski SC, Shiboski CH, Criswell L, Baer A, Challacombe S, Lanfranchi H, et al. American College of Rheumatology classification criteria for Sjogren’s syndrome: a data-driven, expert consensus approach in the Sjogren’s International Collaborative Clinical Alliance Cohort. Arthritis Care Res (Hoboken). 2012;64(4):475-87.